Note: This article applies only to Office 365 operated by 21Vianet in China. The Skype for Business for Android app brings Skype for Business presence, instant messaging (IM), and voice and video calling to your mobile device. Important: To use Skype for Business for Android you need a Skype for Business or Lync account—typically the same user name and password you use when signing in at work or school. If you're already using the desktop version of Skype for Business, then you have a Skype for Business account. Go to the local Android App Store, and search for Skype for Business. See a list of Skype for Business Android app stores in this article. Browse your apps until you find Skype for Business, and then tap the icon to open the app. 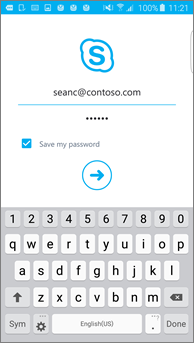 Enter your sign-in address (for example, user@domain.com) and password, and then tap the Advance button ( ). Enter your mobile number with country and region codes. If you're an enterprise voice customer, when Skype for Business can't use a Wi-Fi or cellular data network to make an audio or video call, you'll be called at this number and connected to the audio portion of the call. 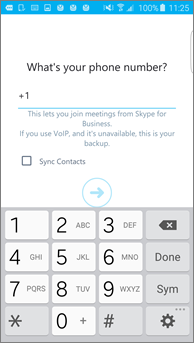 Choose whether to sync your contacts, and then tap the Advance button ( ) to start using Skype for Business. On the main Skype for Business screen, tap your picture, and then tap Sign out.